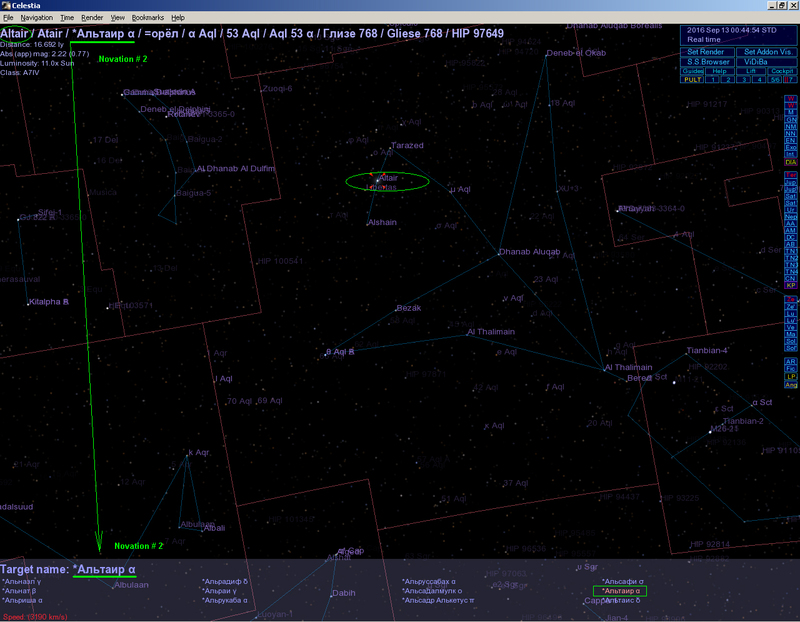 If you click the star with the mouse, the top screen displays the names and designations of this star. Red line is shown what is extracted from starnames.dat file, including the Hipparcos catalog number. And how to be if you badly speak English? What is there to do, if "Star browser" shows only 500 stars, and sorting by name does not work? Last edited by Croc on 14.09.2016, 17:22, edited 1 time in total. In top line, there are three innovations. Consider novation # 1. Aql - Shorthand notation of the constellation Aquila.
? Aql - A Bayer designation. 53 Aql - Flamsteed designation. Aql 53 ? - Combined designation stars (novation # 1). Note. 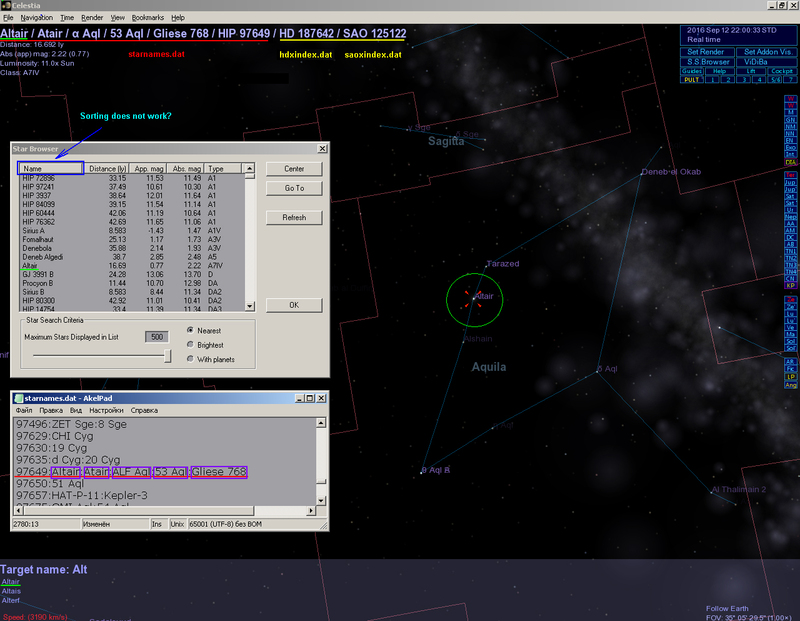 If in the search box enter the designation constellation (eg, Aql), then will be selected all the stars of the constellation (Aquila). At the end of the name blank space and Greek letter (see. Bayer designation) or numbers (see. Flamsteed designation). Last edited by Croc on 14.09.2016, 15:53, edited 2 times in total. Novation # 3 can be useful to all users. It is designed for the literal translation of the name of the stars in their native language or to comment. 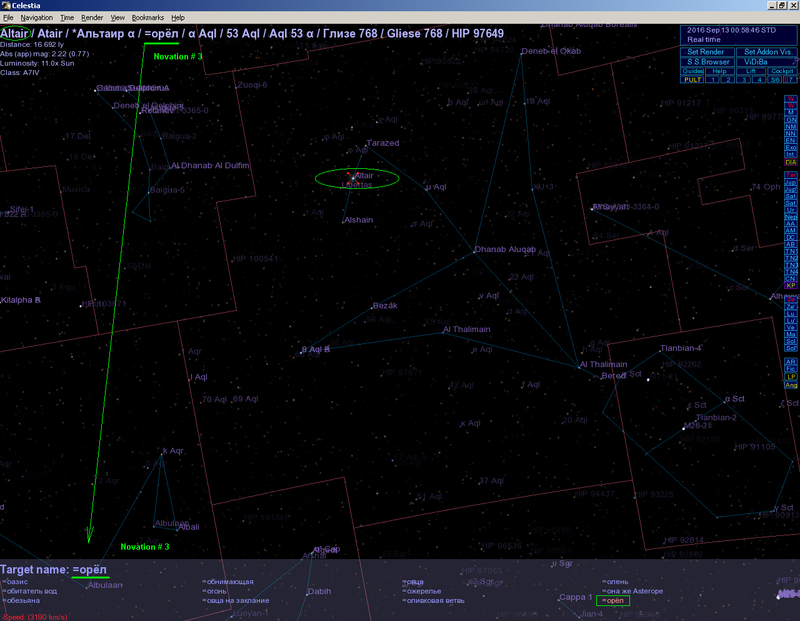 starnames_BF.dat - alternate file on the first place Bayer or Flamsteed designation. I wrote a letter Hanghang (Full name: ?? Yin Yehang) - the author of the translation into Chinese "Celestia User's Guide." 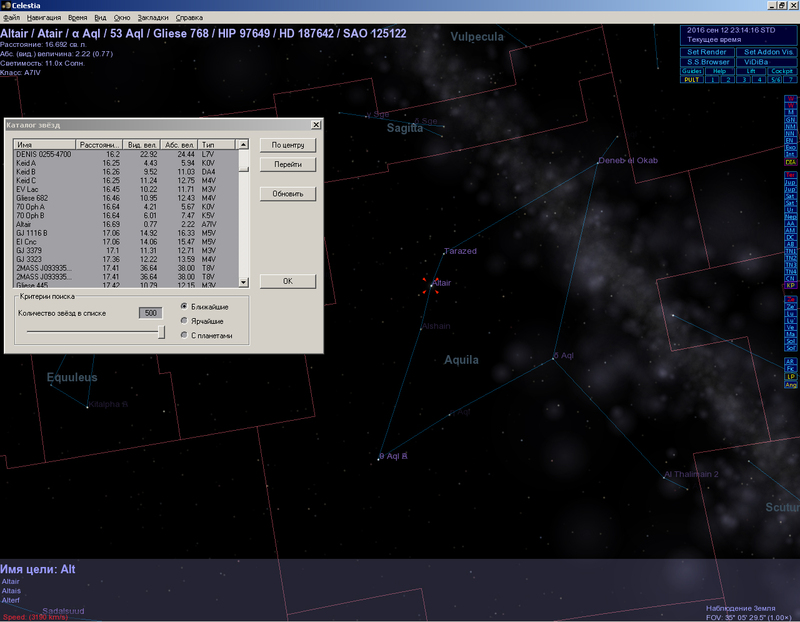 From China Hanghang sent me "A Chinese Star Catalogue with Possible Proper Translations" ~ 3300 stars !!! Thanks to this, in 535 nameless stars have its own Chinese name. Almost all stars have a Chinese name. 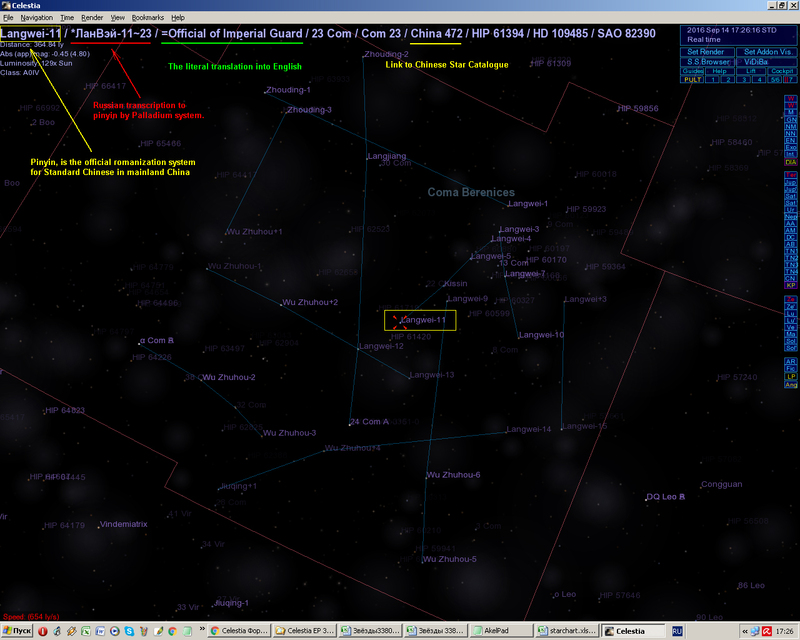 The new outline of the constellation 'Coma Berenices "resemble the Chinese character. At the end of the name is put ~ (tilde) and Greek letter (see. Bayer designation) or numbers (see. Flamsteed designation). 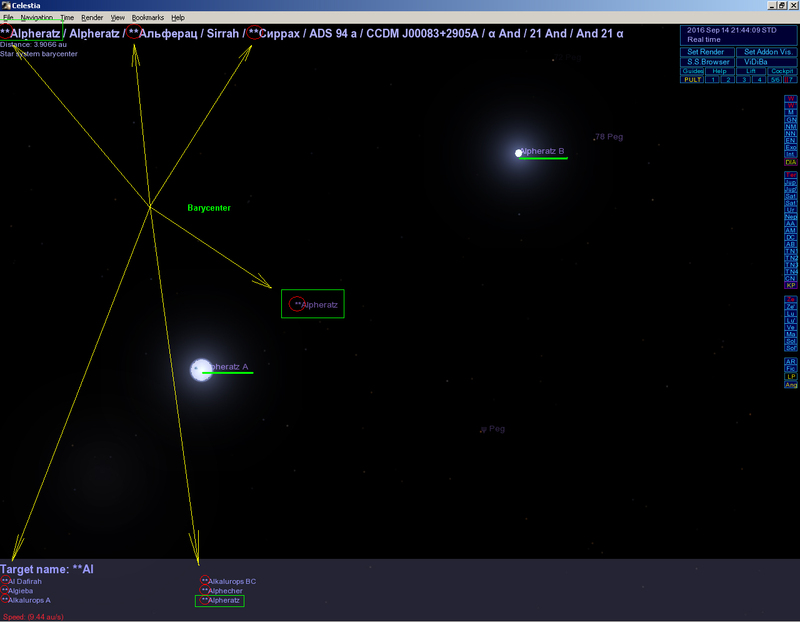 nearstars.stc - Nearby stars and star out to 25 light years, supplementary to Celestia's stars.dat. 677:Alpheratz:*Альферац ? :=пуп коня:Sirrah:*Сиррах ? :ALF And:21 And:And 21 ? 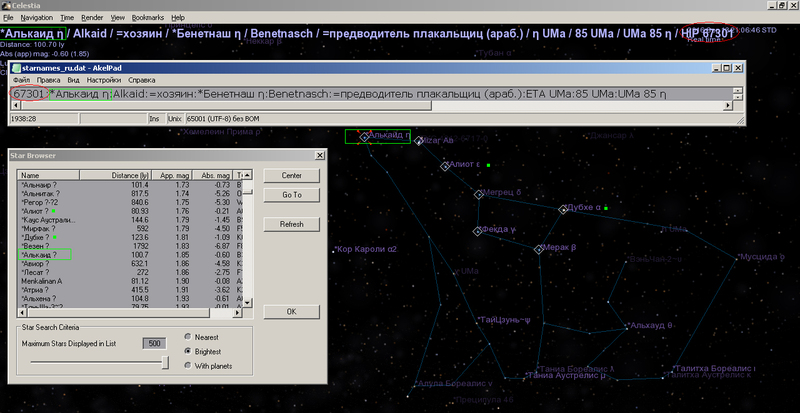 Barycenter 677 "**Alpheratz:Alpheratz:**Альферац:Sirrah:**Сиррах:ADS 94 a:CCDM J00083+2905A:ALF And:21 And:And 21 ?" 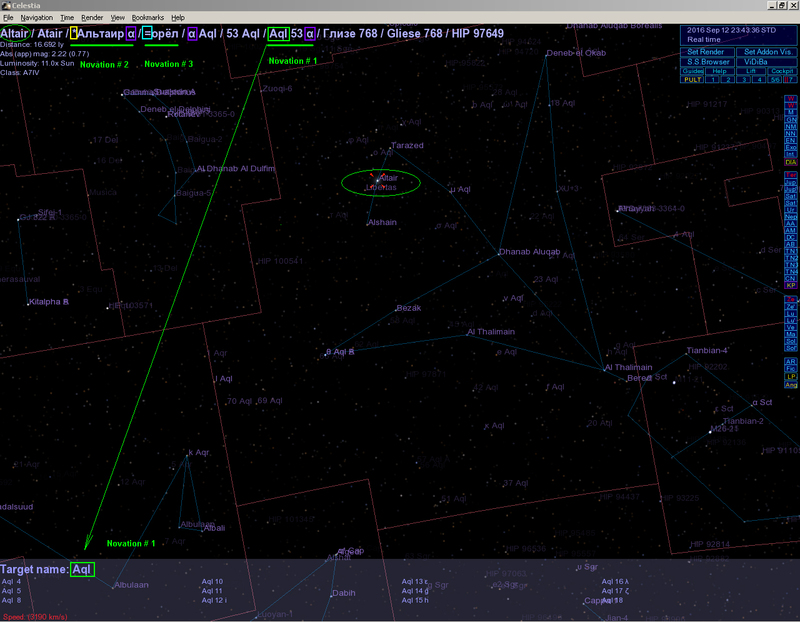 In extrasolar.stc also have novation, but it concerns a small number of names. On this novation will be told in other classes of objects. A new folder named "catalogs"